I am a Blog Ambassador for Fandango Family. Though I have been compensated for this post, my thoughts and words are my own. One of the things I have enjoyed about my movie going experience in the past year is that I have been fortunate enough to experience shows suitable for me with friends and for the fam. In the last month, I have watched two such films Zootopia and Batman vs. Superman. The Zootopia film was a pleasant surprise to me. Kids’ movies have come a long way. It used to be that they were simply sprinkled with a few jokes and references that adults would enjoy, but overall, they were intended, written for, and solely enjoyed by kids. Not so much with Zootopia. I remember seeing the trailer before Star Wars and thinking that it looked like a pretty funny, “cute” film that my kids would enjoy. It turned out to be more intense than I expected. Not intense in a bad way (though there are two scenes in particular that you should be aware of if your children are startled easily), but more in the manner of learning something deeper about the human experience in a kids’ movie. Don’t get me wrong, most kids stories do a good job of having some sort of moral or message, but this movie was different. The film is a great conversation starter for kids and adults about the way we treat each other, and the ramifications of relying on antiquated thinking in related to those different from you. I highly recommend this movie to families (still with the disclaimer that there are a few scenes, one of which made me jump, that may startle some children). The other film that I took in was Batman vs Superman. Despite this being of the comic book genre, it is not a movie for small kids. The film is much darker than most films in the superhero genre including some pretty intense action sequences. This movie I used as a Dads’ Night out activity. It was a great deal of fun to get together a group of dads to take in the movie and then talk about the similarities and differences with the actual comics and prognosticate how the franchise will move forward after this film. The film is full of action and includes a number of cameos from Justice League members and serves as a teaser for a bigger DC Cinematic Universe that’s about to be unleashed onto the screen. There are a number of Easter Eggs (hidden clues) sprinkled throughout the film, so it is worth checking those out online after you have seen the film. 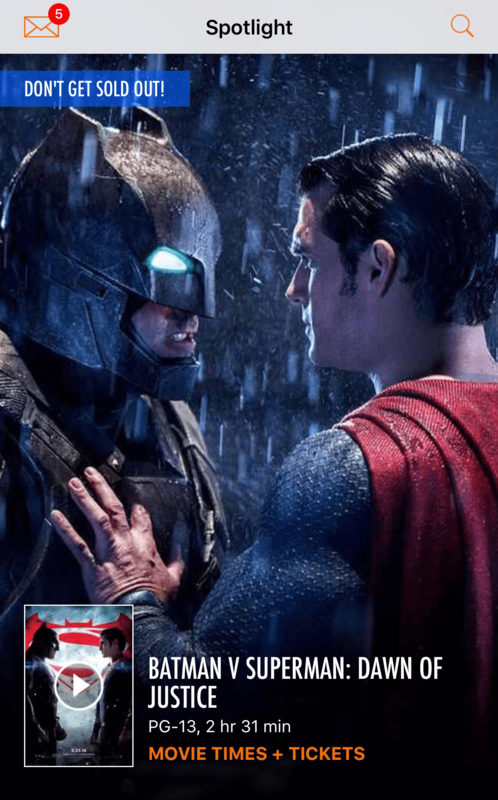 While the reviews have been mixed, at its core Batman vs Superman is a film about a world trying to discern between good and evil, hero and villain, friend and foe, and, perhaps most importantly, right and wrong. Bottom line – whether you are a big kid or a little one, the Fandango Family app and website has something for you to check out.